Gonna let loose of this heavy load and FLY! 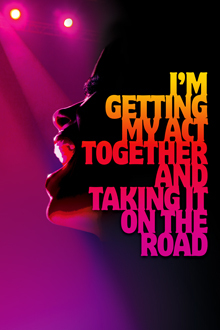 Few shows capture a time period as perfectly as Gretchen Cryer and Nancy Ford’s I’m Getting My Act Together And Taking It On The Road. It was a feminist anthem, performed at Joe Papp’s Public Theater in the late 1970s and is being (briefly) revived as part of the Encores! Off-Center series at NY City Center. The tale (based upon Ms. Cryer’s experiences) is of singer Heather Jones and her attempt at finding her own voice. Today is Heather’s birthday, she’s 39, which her manager Joe urges her to keep to herself. He would prefer she not mention being a single mother or express anger or upset the men in the audience. He wants her to be successful and then she can sneak in the real. Set in a theatre, during the rehearsal for this evening’s opening night, adds to the overwhelming believability of this show. Unlike many “showbiz” shows, we are watching real people have a real experience. The songs are seamlessly woven into the narrative creating almost an operatic quality. It can be challenging to sing and say words so steeped in a movement or time period. Singing rock together with ballads is not for everyone, particularly with the original recording artist sitting in the front row. But Renee Elise Goldsberry (Good People, Rent, Lion King) transcends even the highest expectations. Her voice has a quality not often found today; it is devoid of belting and breathiness and filled with richness and feeling. Her sound is reminiscent of female folk singers of the 1970s, a delightful auditory nod to the time period. There is nothing anachronistic about her performance however. She is fresh, real and present. She sings of growing up in the 1950s and being told to smile. “If you smile in just the right way you’ll make a pretty wife and someone will take care of you for all your pretty life.” When Ms. Goldsberry sings these words we don’t think of sepia toned photos of a little girl in front of the family car. Her interpretation makes us think of Facebook photos showing girls in identical suggestive poses. Fredrick Weller (Glengarry Glen Ross, Take Me Out) is perfectly cast as the layered manager Joe. His delivery (of some of the funner lines) is timed to the millisecond. He is infuriating and endearing and a wonderful counterbalance to the “artist” energy on the stage. Theirs is a friendship that you suspect and hope will go the distance, despite (or maybe because of) their differing viewpoints. The friendship itself is serenaded in the showstopper Dear Friend. Joe wants Heather’s act to play the Troubadour, and he feels that her reading her divorce decree out loud is not the ticket to success. But Heather’s been down this road before. She has recorded a hit song that now makes her physically ill in its sweetness. She works on a soap opera where she’s undoubtedly polished and pushed into a mold. She has some experience with being put in a package and sold. The (fabulous) band and her female back-up singers are only too glad to help her deliver the real. Christina Sajous (Spiderman, Baby It’s You) and Jennifer Sanchez (West Side Story, Ghost) create a perfect sound and harmony with Ms. Goldsberry. Jason Rabinowitz (acoustic guitar) breaks the audience and Ms. Goldsberry’s heart with a solo performance of In A Simple Way I Love You. Brenda – is it OK to put my thoughts on this here? Lovely article, I haven’t seen this version – yet! It’s more than okay Freddie, it’s Fabulous!!! We have tickets to tonight’s performance. I was concerned about reliving a past experience that I have held so close to my heart but I am more excited than ever after reading your post. I think that I saw the show every day for a week last time around. My kids have grown up listening to the record and seeing me wearing my red tee shirt. Our 25 year old son will be accompanying me and my husband this evening. We had the same album & trepidations about a new production! I can’t guarantee that you’ll be delighted as I was. But I can share with you that the audience response was overwhelming!